SEATTLE, Washington, August 27, 2010 (ENS) – Seattle is preparing for an electric car roll-out that could amount to 200,000 electric vehicles on the road by 2030. Ford Motor company and the City of Seattle announced Thursday that they will work together to develop consumer outreach and education programs on electric vehicles as well as share information on ensuring the electrical grid can support the anticipated demand. 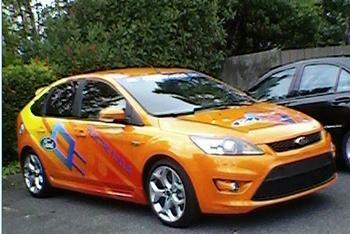 Company executives arrived from Dearborn, Michigan with a bright orange Ford Focus Electric passenger car prototype, one of only three in the world, that silently and efficiently navigates the streets without emitting pollutants of any kind. Since Seattle runs on 90 percent hydroelectric power, the electricity needed to charge the car’s lithium-ion battery is generated with a minimum of climate-changing fossil fuels. 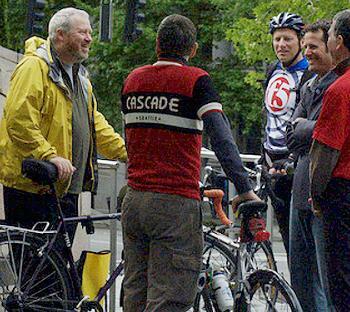 That is important to Seattle’s new mayor, Mike McGinn, who rides his pedal-electric bike to work most days. McGinn said reducing fossil fuel use will require many changes such as conserving driving distances by developing mixed-use neighborhoods, using cleaner fuels and alternate means of transportation – electric cars, bikes, walking and public transit. “I think we’re starting to look at the transportation sector the way we used to look at our electricity sector in looking at how can we conserve and how can we use less,” he said. The mayor said electric vehicles will help the city comply with federal Clean Air Act standards on ozone. “We’re right on the border and are likely to be out of compliance in the near future, leading to some pretty significant regulations” from the EPA, said McGinn. Ford brought its electric vehicles to Seattle and Portland, Oregon this week – the first two cities on a 14-city cross-country tour Ford is undertaking to publicize its new electric vehicles and educate consumers about what to expect and what is needed from the public and private sectors to support this new technology. “Ford has an aggressive plan to bring five new electrified vehicles to market over the next two years, including the Transit Connect Electric later this year and the Focus battery electric in 2011,” said Mike Tinskey, Ford’s manager of vehicle electrification and infrastructure, told forum participants. The city has received two Recovery Act grants from the federal government to help prepare for the electric car revolution. One $500,000 grant will allow the city to put 50 charging stations on public property such as the Municipal Building, so the city can begin electrifying its fleet. The other grant will help install some 1,500 public-use charging stations in other locations around the city. A grant to the state of Washington will enable planners to identify critical areas to locate electric vehicle charging stations along the major freeways I-5 and I-90. Jorge Carrasco is responsible for ensuring the city’s electricity infrastructure can handle the demand when electric vehicle owners plug in to recharge. As superintendent of Seattle City Light, Seattle’s publicly owned electric power utility, Carrasco says he is confident there will be enough power to handle hundreds of thousands of electric vehicles. “Fortunately, City Light today has surplus power, so we’re trying to project forward what kind of load we might experience depending on how many cars are brought into our service area,” he told ENS. “Over next 20-40 years we expect that as many as 60 percent of the vehicles in our service area may be electric vehicles,” he said, a number he estimates could be as high as 200,000 vehicles. “We’re pretty comfortable that from a load standpoint we can handle this if the market grows in that fashion,” he said. The 10th largest public electric utility in the United States, Seattle City Light has been fully offsetting its carbon emissions since 2005. It is the only large utility in the country to achieve carbon neutrality, which means electric cars charged in City Lights service territory will run totally clean. 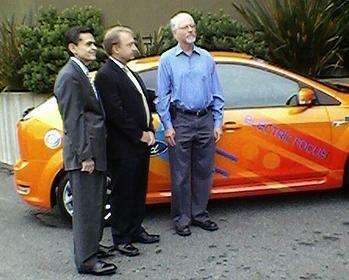 Carrasco is an electric and hybrid car enthusiast who drives one of Seattle’s 6,600 hydrids. Seattleites can see him zipping around town in his 2009 white Ford Escape hybrid. Seattle also is one of the markets selected for early release of Nissan’s all-electric Leaf. Nissan begins rolling out its Leaf to select markets in December, with increased availability beginning in spring 2011, and full market rollout in 2012.